It didn’t take much time watching RWBY, for Blake Belladonna to win my heart. Though every female character in the Rooster Teeth web-series RWBY will land a spot on my Favorite Female Characters list, Blake had to be the first I explore more in depth. 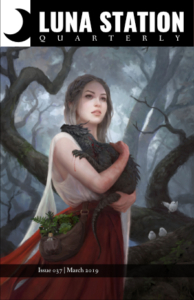 Her character arc in season 1 was the first hint for me that this would be a series which brought the fun of fantasy and adventure stories, but did not ignore that fantasy is a perfect genre for tackling real world issues. Blake is a Faunus. In the World of Remnant, the Faunus are half-human half-animal. Full-humans treat them no better than animals, and created a hierarchy with the Faunus at the bottom. Blake comes from this under-class and like many people from minority backgrounds in the real world, hides her identity in order to fit in. She can pass as Full-Human with the help of black bow to cover her cat ears. But that’s not the only thing Blake is hiding. She had been a member of the radical Faunus group The White Fang. The White Fang morphed from an organization intent on gaining equal rights for the Faunus, into a militant terrorist group. Through Blake’s character development, RWBY addresses contemporary issues of racial discrimination, militant tactics and terrorism. As an undergraduate student I studied contemporary Turkish political history (roughly 1960s to the present) and grew fascinated by radical politics and eventually the Kurdish movement within Kurdistan (southeast Turkey). Blake’s involvement in the White Fang became a direct correlation to my research interests. But her struggle to find a balance between fighting for equality and fighting through violence alone, could just as easily be compared to the struggles of the Black Lives Matter Movement, the fight for Palestinian rights, the fight against Islamophobia and many other social and political movements going on today. To fight prejudice, do you put on a bow, try to become respectable and forget your past? Do you pick up a gun and take to the streets? Do you pick up a sign and take to the streets? RWBY does not advocate violence and terrorism, but reminds viewers why someone would be tempted toward those methods in the first place. I love how Blake never becomes a political statement for the show’s writers and creators, but that politics is interwoven into her character. 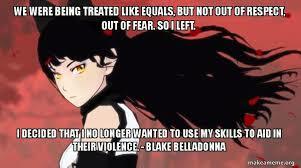 Easily, Blake became my favorite of the main heroines (Ruby, Weiss, Blake, Yang). Yes, I could relate her struggle to my academic interests, but I could also just relate to her. Team RWBY begins a hunt for Roman Torchwick, a criminal working with the White Fang. Blake pushes herself and pushes herself, losing sleep, letting her grades drop, abandoning her friends, because all that matters is the End Goal. As a writer I understand that drive. The feeling that nothing else matters other than your work, and the pressure and intensity that comes with taking yourself too seriously. She is a woman who refuses to stop. Yet, through her friends (and *cough* her female romantic interest Yang) learns to slow down. Through Blake, we too can learn to slow down and take time for the ones we love. Next Happy (almost) Birthday Patricia McPhillip!